Preheat oven to 330°F. Cream together butter and powdered sugar. Add eggnog and mix together. Slowly add flour and salt. Mix until dough comes together. On a lightly floured surface, roll out the dough to 1/4-inch thickness and cut out dough with cookie cutters. Bake for about 12-14 minutes, or until it is a light golden-brown color on top. Cool completely to harden. Mix together 2 cups of powdered sugar, 1 teaspoon of bourbon, and 1 teaspoon of vanilla. Add just enough water, drop by drop, to create a glaze. Drizzle over shortbread cookies. 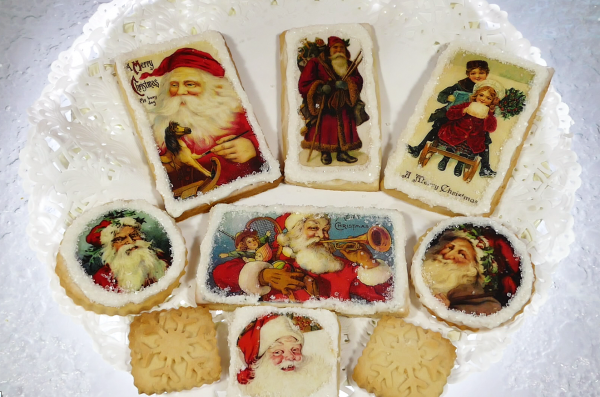 For Edible Wafer Paper Designs: One you make your shortbread cookies, coat them with royal icing and then let them sit overnight (I make my royal icing with 2 cups of powdered sugar, 1 teaspoon of meringue powder, and as many drops of water necessary to create a glaze. Mix together until smooth and you've achieved your desired consistency.) Cut out your beautiful wafer designs, and then brush a little corn syrup on the back of the wafer paper. Set the paper, design side up, on the cookie. Smooth it down with your fingers to make sure it's tacked down, and then let it set for about 10 minutes (the instructions say to turn the cookie upside down). When the cookies are dry, ice the edges with royal icing that you have thickened, and sprinkle with decorative sugar, then shake off the excess sugar. Where to find Wafer Paper: I found my gorgeous paper at Fancy Flours. The designs I purchased were all in their Winter and Holiday Catalogs. The category is Edible Wafer Papers.